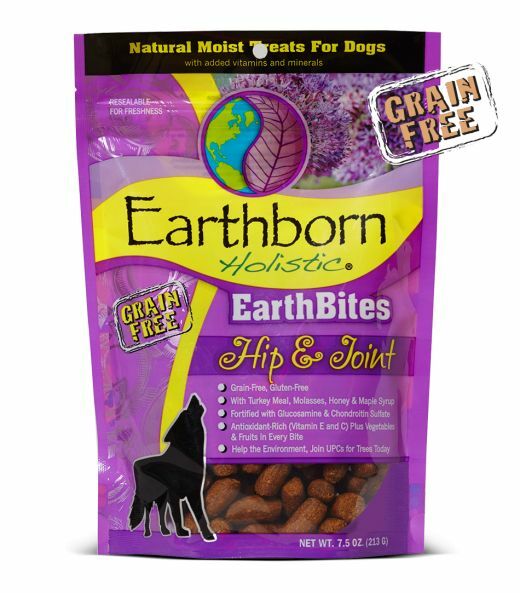 Earthborn Holistic® EarthBites™ Hip & Joint moist treats are a delicious treat for dogs needing extra joint protection in their everyday lifestyles. Glucosamine and Chondroitin Sulfate help maintain proper joint function and cartilage health. This antioxidant-rich formula contains lean, premium turkey meal blended with wholesome vegetables and fruits for high palatability. Turkey Meal, Peas, Honey, Pea Starch, Glycerin, Chicken, Canola Oil (preserved with Mixed Tocopherols), Pea Fiber, Dried Egg Product, Phosphoric Acid, Natural Flavors, Dried Apples, Dried Blueberries, Dried Carrots, Dried Spinach, Dried Cranberries, Flaxseed, Salt, Potassium Sorbate (preservative), Vitamin E Supplement, Mixed Tocopherols (preservative), Rosemary Extract, Green Tea Extract, Glucosamine Hydrochloride, Chondroitin Sulfate, L-Carnitine, L-Ascorbyl-2-Polyphosphate (source of Vitamin C), Dried Lactobacillus Acidophilus Fermentation Product, Dried Enterococcus Faecium Fermentation Product, Dried Lactobacillus Casei Fermentation Product.